Location : Cambodia occupies an area of 181.035 square kilometers on the Indochina peninsula and borders Thailand, Lao and Vietnam. 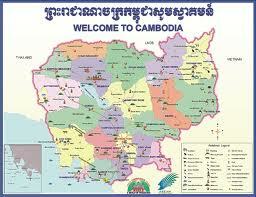 The country consists chiefly of a large alluvial plain ringed by mountains and the Mekong river. The plain is centered on lake Tonle Sap, which is a natural storage lake of the Mekong, which regulates the course, in case of flooding, and minimizes the effects. Cities : Phnom Penh, the capital, Battambang, Sihanoukville, Kampong Cham, Kandal, Prey Veng, Takeo, Kampong Thom, Svay Rieng, Kampong Speu, Stuhg Treng. Climate : Cambodia has sun almost year round. Average temperature 27 degrees Celsius; minimum tenperature is about 15 degrees. Dry season from November to April, temperature ranging from 15-27 degrees. December and January is the coolest period. Rainy season from mid-May to October, temperature ranging from 27-35 degrees with humidity up to 90%. The hottest month is April. Population : The total population is over 17 millions (with an important population growth of 2,5%) with 90% constitued by Khmers. Other ethnic backgrounds: Chinese, Vietnamese, Cham (muslims) and Khmer Loeu (hill tribes). Religion : The official religion of Cambodia is Theravada Buddhism, that was introduced into Cambodia in the 12th century by King Jayavarman VII. There are also around 500.000 Muslims and 60.000 Christians. Rivers and lakes : The Mekong river flows through Cambodia from Lao, North, to Vietnam, South. Phnom Penh was built in an auspicious location where the Mekong intersects with the Bassac and Tonle Sap rivers. The Tonle Sap lake and the Tonle Sap river create a unique phenomenon over the world, reversing its direction twice a year. Mountains : The Dangrek mountains run along the Northern border, the Cardamom mountains run Southwest of Battambang. The Elephant mountains run East and Southeast of Phnom Penh. The country's tallest mountain, Phnom Aoral, 1.813 m, lies East of the capital between Kampong Chhnang and Kampong Speu provinces. Forests : The last virgin rain forests are protected, by Royal decree, in the Northeastern and Southeastern regions of Cambodia, as well as the Cardamoms Mountain, which are rich in rare woods. In November 1993, by that decree, the King established a system of 23 protected areas covering 3,4 million hectares. Language: Except Khmer, which is the official language, French is only spoken by old and educated people. As everywhere, the trend among younger cambodians has been to study English as a second language for economic reasons. Currency : The unit is the Riel. Riel denominations are 100, 200, 500, 1.000, 2.000, 5.000, 10.000 and 20.000. There are no coins. American dollars are generally accepted throughout the country, as well as Thai Baths. Local time : + 7 hours GMT. Health: Although no vaccination is required, it is recommended to protect oneself against cholera, typhoidi and hepatitis, especially if you travel to the provinces. January 1, International New Year Day. 7, Victory Day over Genocide. Tet Festival, New Year of both Chinese and Vietnamese lunar calendar (January or February). March 8, International Women Day. April 14 - 16, Bonn Chaul Chhnam, Khmer New Year. May 1, International Labour Day. 12, Visak Bochea, Buddha's Birthday. 13, 14, 15, His Majesty the King Norodom Sihamoni's Birthday. 16, Bonn Chroat Nongkoal, Royal Ploughing Cremony. 18, Samdech Preah Akeak Mohesey Norodom Monineath Sihanouk's Birthday. September 21 - 23, Pchum Ben, Spirit Commemoration Day. October 29, Coronation Day of His Majesty the King Norodom Sihamoni. November 4 - 6, Water Festival. 8 - 5, Bonn Kathen. December 10, Human Rights Day.